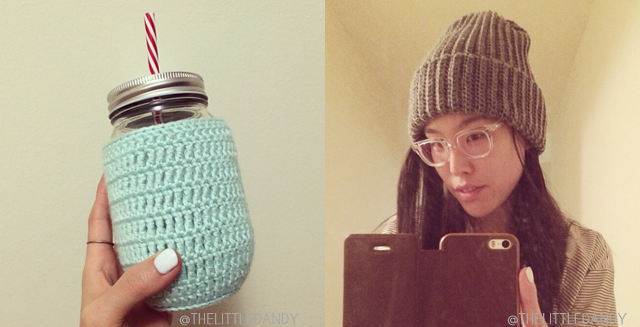 THE LITTLE DANDY : Recent Projects: Crochet & The Little Dandy Shoppe! 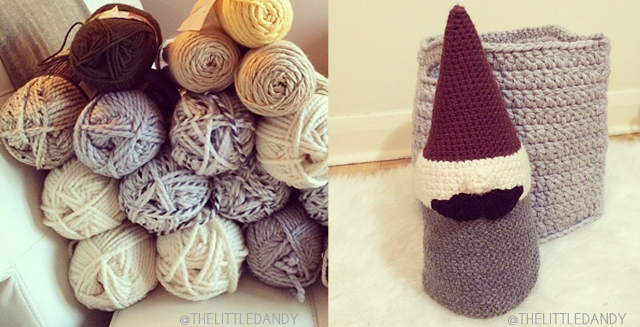 Recent Projects: Crochet & The Little Dandy Shoppe! Follow me on Instagram @thelittledandy :). Naturally, when the weather gets cold, my vigor with scheduling OOTD 'photoshoots' with the boyf slows down because....well, it's damn cold outside in Canada. I know - I really know, I should get around to setting up a well-lit indoor space to do decent style-shoots, but with my recent move I'm still not quite settled in yet (I'm still on the hunt for cute storage solutions to free up some floor space! Should I get the IKEA Expedit shelving?? Gah...). Anywhoo, for that reason there has been a lack of outfits going on, but I haven't been sitting around like a scab of...life...(? ?...sometimes, I don't even know...). I've been keeping myself pretty busy with home decor DIYs (videos are in post-production! ), and taking up a a new hobby: crochet. OMFGzzzz I am obsessed. I am a real 'Little Old Lady', I promise you. Growing up, my mom taught me how to knit. It was something that I was able to do, but never really enjoyed doing; knitting is time consuming and frickin' stressful. I was always in awe when I watched my mom crochet because it looked like a perfect rhythmic motion - like a dance routine I really wanted to learn. Anyway, fast forward about a hundred years into the age of 'everyone can do anything thanks to Pinterest and YouTube' - I've taken up crochet with serious gusto; so much gusto that I've gone as far as taught a few friends and started a Facebook group and Tumblr page called 'Little Old Ladies'; SO much so that I've gone and created an Etsy shop to sell my wares. 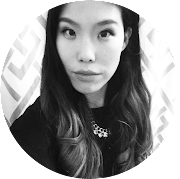 And here's the real kicker; I've taken up crochet with SO much gusto that I've even signed myself up for my first vendor experience at the upcoming Annex Flea in Toronto on February 9th. Tell me, do you crochet? Do you love knits? I freaking love it all! 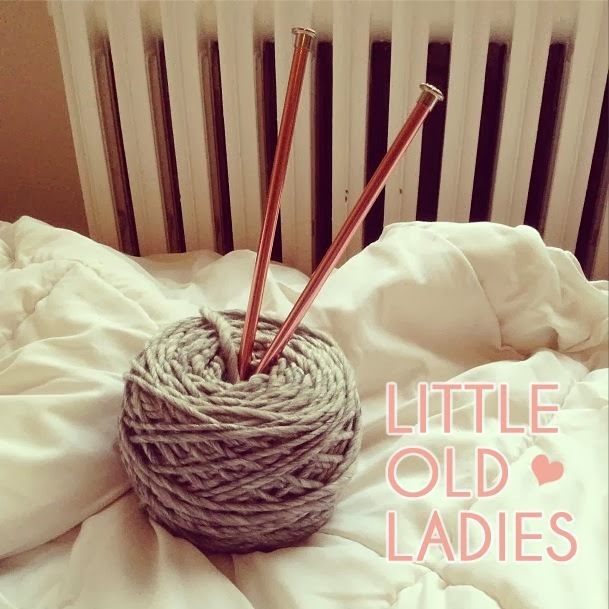 Maybe it's my die-hard love for Scandinavian design, or mid-century interior decor, or maybe it's just my true inner spirit of a little old lady (umm, I'm still waiting on a hair appointment to dye my dark locks grey) - whatever it is, I am alllll about crocheted-everything! I haven't sold any of my wares yet, but coming up with new projects just gets me giddy. I've perfected the hat, the scarf, the mitt, the basket...I'm ready to move on to more home decor items like rugs, throws, and poufs. I really hope you all enjoy my creations! 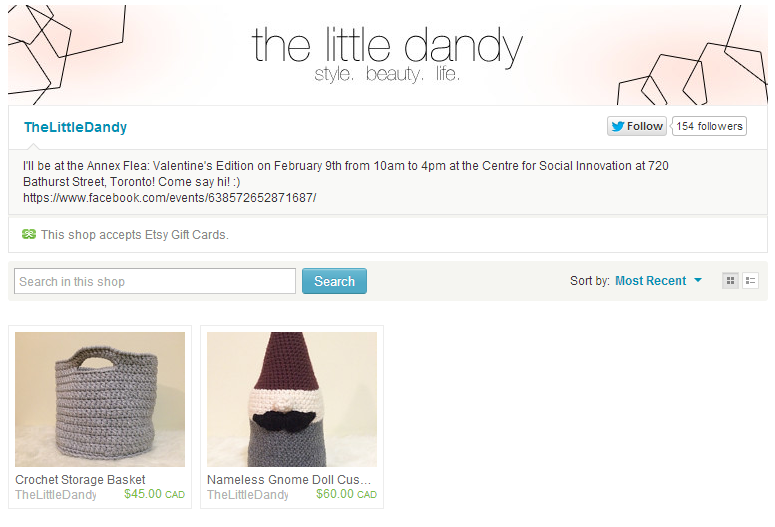 For those in the Toronto area, I hope you'll stop by my booth at the Annex Flea on February 9th! The Annex Flea Market will take place at the Centre of Social Innovation at 720 Bathurst Street from 10am to 4pm. 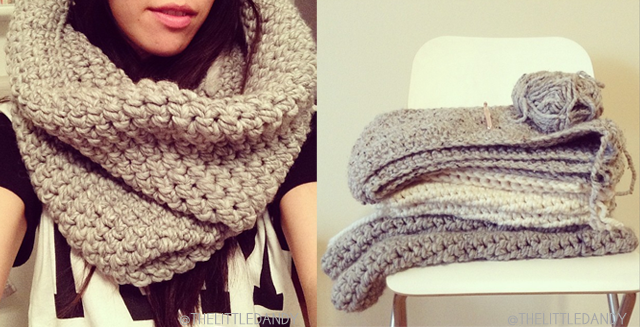 love the oversized cowl. I don't crochet a lot as I'm not very good at it. But I do knit a lot. btw, added you as a friend on ravelry. Aw thanks! The gnome was my fave, but he got sold at the Flea Market! I hope he's loving his new home :). You'll get better at crochet! I only started this past September :). I'm nowhere near perfect - as long as you enjoy it, that's all that matters <3. Thanks Audrey! The beanies were a hit at the Flea Market :).